You need Printed Brochures but what size? 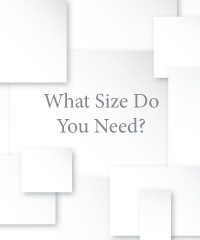 When we refer to the size of Printed Brochures, we are referring to the size of the finished brochures. For example, when we refer to A4 Brochures we mean 297x210mm. The brochures can be either portrait or landscape orientation. 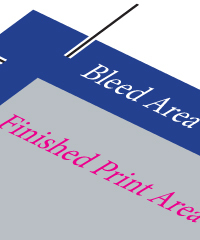 When setting up the artwork for your Printed Brochure you need to add ‘bleed’ to all four edges of each sheet. We recommend 4mm of bleed added to all four sides. 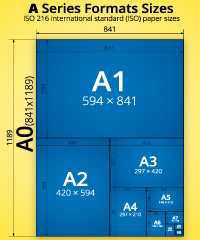 Therefore the overall size of an A4 Brochure artwork would be 305x218mm. When exporting the artwork please ensure you add crop marks. 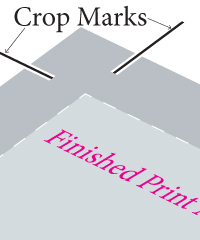 The crop marks need to be set to the finished brochure panel size, as they will be the marks we trim the sheets to. Please contact us if you would like help with this.